Not surprisingly, April fools brings it share of "new found" cryptids. 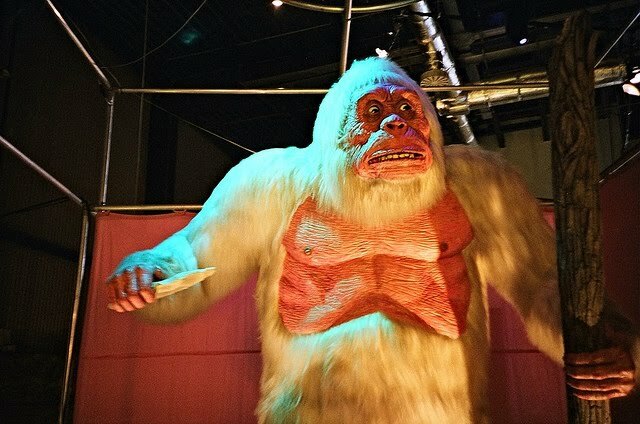 Even less surprising, these "cryptids" would show up on a top 100 list of April Fools Hoaxes at MuseumofHoaxes.com. 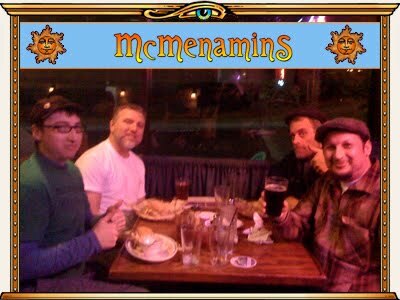 Consider this as Bigfoot Lunch Club's Public Service Announcement that April 1st is a fallacious day for discovering new cryptids. 2008: The BBC announced that camera crews filming near the Antarctic for its natural history series Miracles of Evolution had captured footage of Adélie penguins taking to the air. It even offered a video clip of these flying penguins, which became one of the most viewed videos on the internet. Presenter Terry Jones explained that, instead of huddling together to endure the Antarctic winter, these penguins took to the air and flew thousands of miles to the rainforests of South America where they "spend the winter basking in the tropical sun." A follow-up video explained how the BBC created the special effects of the flying penguins. 1972: On March 31 1972, a team of zoologists from Yorkshire's Flamingo Park Zoo, who were at Loch Ness searching for proof of Nessie's existence, found a mysterious carcass floating in the Loch. Initial reports claimed it weighed a ton and a half and was 15 ½ feet long. The zoologists placed the body in a van and began to transport it back to the zoo. However, the police chased down their truck and stopped it under a 1933 act of Parliament prohibiting the removal of "unidentified creatures" from Loch Ness. The body was then taken to nearby Dunfermline for examination. The discovery of the carcass received worldwide media attention. The British press dubbed it "Son of Nessie." But upon examination, Edinburgh scientists identified the creature as a bull elephant seal from the South Atlantic. The next day John Shields, Flamingo Park's education officer, confessed he had been responsible for the body. The bull elephant seal had died the week before at Dudley Zoo. He had shaved off its whiskers, padded its cheeks with stones, and kept it frozen for a week, before dumping it in the Loch and then phoning in a tip to make sure his colleagues found it. He had meant to play an April Fool's prank on his colleagues, but admitted the joke got out of hand when the police chased down their van. 2007: In late March 2007, images of an 8-inch mummified creature resembling a fairy were posted on the website of the Lebanon Circle Magik Co. Accompanying text explained how the creature had been found by a man walking his dog along an old roman road in rural Derbyshire. Word of this discovery soon spread around the internet. Bloggers excitedly speculated about whether the find was evidence of the actual existence of fairies. By April 1 the Lebanon Circle website had received tens of thousands of visitors and hundreds of emails. But at the end of April 1, Dan Baines, the owner of the site, confessed that the fairy was a hoax. He had used his skills as a magician's prop-maker to create the creature. Baines later reported that, even after his confession, he continued to receive numerous emails from people who refused to accept the fairy wasn't real. 1984: The Orlando Sentinel featured a story about a creature known as the Tasmanian Mock Walrus (or TMW for short) that many people in Florida were supposedly adopting as a pet. The creature was said to be four inches long, resembled a walrus, purred like a cat, and had the temperament of a hamster. What made it such an ideal pet was that it never had to be bathed, it used a litter box, and it ate cockroaches. In fact, a single TMW could entirely rid a house of its cockroach problem. Reportedly, some TMWs had been smuggled in from Tasmania, and there were efforts being made to breed them, but the local pest control industry was pressuring the government not to allow them into the country, fearing they would put cockroach exterminators out of business. Dozens of people called the paper trying to find out where they could obtain their own TMW. 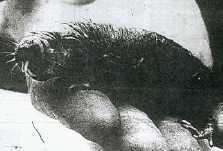 A picture of a Tasmanian Mock Walrus accompanied the article. Skeptics noted that the creature looked surprisingly similar to a Naked Mole Rat. The April 1, 1998 online edition of Nature Magazine revealed the discovery of "a near-complete skeleton of a theropod dinosaur in North Dakota." 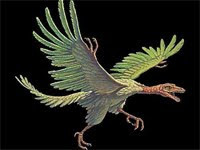 The discovery was referred to in an article by Henry Gee discussing the palaeontological debate over the origin of birds. The dinosaur skeleton had reportedly been discovered by Randy Sepulchrave of the Museum of the University of Southern North Dakota. The exciting part of the discovery, according to the article, was that "The researchers believe that the dinosaur, now named as Smaugia volans, could have flown." In actuality, the University of Southern North Dakota does not exist, though it has been made famous by Peter Schickele who refers to it as the location where the music of the obscure eighteenth-century composer PDQ Bach was first performed; Smaug was the name of the dragon in Tolkein's The Hobbit; and Sepulchrave was the name of the 76th Earl of Groan in Mervyn Peake's Titus Groan. This Earl, believing that he was an owl, leapt to his death from a high tower, discovering too late that he could not fly. In our previous post New Search for Lost Yeti Artifacts of Nepal we mentioned how Kiwi adventurer and Air New Zealand pilot, Mike Allsop, plans on finding the Yeti skull and skeletal hand. These artifacts were stolen a monastery in the tiny Nepalese village of Pangboche, in the 1990s. 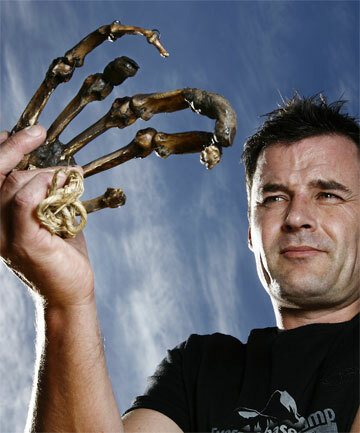 He has commissioned special effects shop Weta Workshops, a multi-award winning conceptual design and physical manufacturing facility known for their work on the Lord of the Rings trilogy and the Narnia films, to create replicas of the skull cap and skeletal hand in order to replace what was stolen. Ultimately Allsop is hoping someone will return the originals, "I am hoping that the person who has them wants to give them back." We also mentioned Allsop will hand-deliver the replicas to the monastery when he and 17 Air NZ co-workers travel to Pangboche in April. Its April and the Dominion Post has an update on the story. 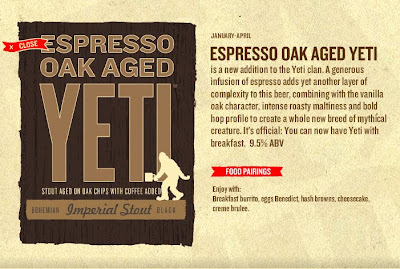 Yetis, monks, thieves and Jimmy Stewart. Mike Allsop's tale has all the makings of a Hollywood movie. But there is nothing phony about his mission to help restore the pride of the 1000-year-old Pangboche monastery in Nepal, nestled high in the Himalayan foothills near Mt Everest base camp. Mr Allsop, an Air New Zealand pilot, Everest climber and adventurer, will return to the monastery this month with a special gift from Sir Richard Taylor's Weta Workshop. The replica hand is a copy of the monastery's "original" yeti hand, which was stolen by persons unknown in the 1990s. The hand, and part of a skull that proved to be from a rare goat, provided the monastery's small source of income, from tourists who came to see the artefacts. In the 1950s, explorer Peter Byrne and Hollywood actor Jimmy Stewart conspired to take one finger from the hand and have it tested in Britain, but the results were inconclusive, Mr Allsop said. "There's two stories – one says Peter Byrne got the monks drunk and switched the finger. But I've spoken to him, and he says he offered to pay the monks and they agreed to let him take it." Since the rest of the skeletal hand and the skull part were pinched in the 1990s, the monastery and its leader, Lama Gershe, have been without their main source of income. Mr Allsop hopes the replica items will help it survive until he can track down the originals. He admits being sceptical about the existence of yetis, but said the legend was real enough to the monks. "I asked Lama Gershe if he believed in it, and he started arguing with his wife in front of me. His daughter was translating for me and I asked her what they were fighting about. "She told me he'd said his wife's friend was attacked at her back door by a yeti five years ago – and she'd said no, it was 10 years. Mr Allsop has had a special connection with Pangboche since he first visited on his way to climb Everest in 2007. Lama Gershe helped to name his youngest son, Dylan Michael Dalha Allsop. Last year when his eldest son, Ethan, turned seven he took him to see Everest and Pangboche, and plans to do the same with his younger children when they reach the same age. He will leave for the monastery, with 15 Air New Zealand staff, on April 17 to install the replica artefacts in a secure glass case. He hopes his campaign, Return The Hand, will locate the original bones, but time may be running out for Lama Gershe, who suffered a stroke last year. 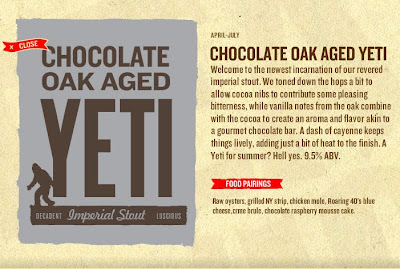 The yeti, or abominable snowman, is one of the most famous mythological creatures. It is said to inhabit the mountainous areas of Nepal, Tibet and India. 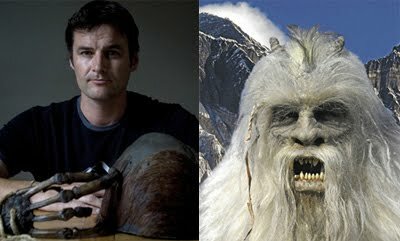 Several explorers, including Peter Byrne, believe they have found tracks and dung belonging to yeti. Sir Edmund Hillary, conqueror of Mt Everest, led an expedition in 1960 with a team of 21 scientists, climbers and other specialists, along with 310 Sherpas, to do scientific research on acclimatisation to altitude and to hunt for yetis. They failed to find any but brought back hair samples. Fellow Everest conqueror Tenzing Norgay told Sir Ed his father had twice seen a yeti. Sir Ed's long-time friend, Tom Scott, said Sir Ed did not believe in the yeti but liked the concept. "The locals believed in them and Ed felt really bad for myth-busting them. He liked the possibility of the yeti. If someone found one, he would have been delighted." 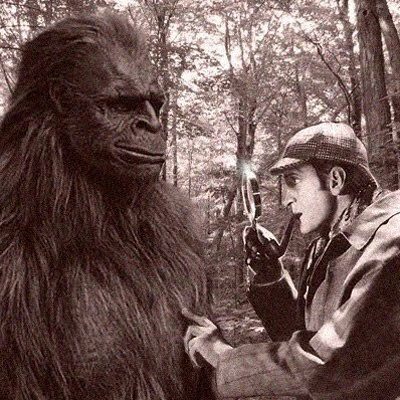 Roger Marsh, paranormal news examiner, writes about a new Bigfoot case in Pennsylvania investigated by Stan Gordon. Stan Gordon has his fingers in a lot of unexplained phenomena including; UFO, Bigfoot, Thunderbirds, Black Panthers and other unexplained sightings within the Keystone State. Below is just the excerpt that was written by Stan you can go to the Examiner to read Roger Marsh's whole take. Is it a Bigfoot the witness saw? 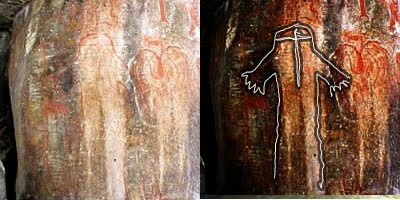 The story kinda loses us when it comes to the part that goes "The witness also saw what appeared to be wings on its back which were tucked into its body, with the wing tips extending toward the side of its head". The witness did add the caveat, "appeared". read the article and judge for your self. One of my co-workers asked me, jokingly, if I saw any sasquatches on my recent holidays. A few of us in the newsroom are mountain bikers and encounter the occasional deer and bear on our wilderness excursions. They scurry off at the sight of creatures with shiny, coloured heads that ride on animals with round black hooves by grabbing their antlers and rapidly kicking the enslaved beasts. When you ride by yourself and stop for a drink and a snack you sometimes get that eerie feeling someone or something is watching you. 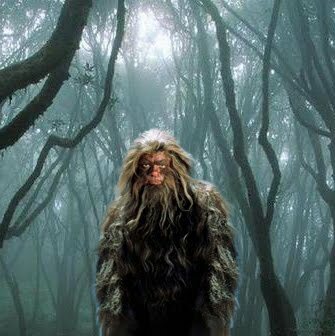 I’ve never seen a sasquatch on the Island – I guess most other people haven’t either – but, a bunch of us kids were pretty sure that’s we saw one night at summer camp many years ago. I was 11 in July 1969 when my mother sent me to Camp Jubilee, about halfway up Indian Arm east of Vancouver. Camp activities involved a lot of swimming, hiking, archery and verbally and physically bullying each other to establish the pecking orders in our cabins. One afternoon we hiked into the bush to camp overnight in a wide dry creek bed. As it got dark, kids hunkered down in the rocks for the night. I found a comfortable spot in the boulders. Some boys caught little lizards that ran around in the rocks. Occasionally a kid would let out a yelp when his new pet bit him. We were settling down when we heard something trucking through the woods, snapping branches as it went, seemingly unconcerned about the noise it made. A bear maybe? The last of the twilight was fading, but the moon was full, so there was plenty of light to see by. What walked out of the woods was no bear. It was about 12 metres from us, not just walking upright, but taking big easy strides across the rocks. About halfway across the creek bed it stopped, as if it realized suddenly that we were there, and turned to look at us. 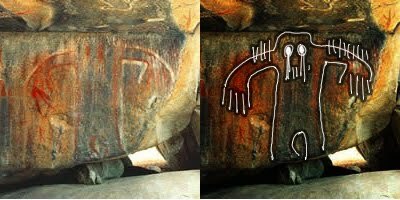 It was nearly two metres tall and its body was proportioned just like a large man’s, except its forearms were a little longer than ours, so its hands hung closer to its knees. Its body was covered in hair, but it was so fine, almost like an Irish setter’s, that you could see its muscle definition underneath. I remember his forearm muscles being clearly defined and, yup, “it” was definitely a “he”. Then he turned and continued on his way. The sound of branches snapping started again when he entered the woods and eventually faded into the distance. The encounter didn’t frighten me. I was simply amazed. Our silence broke when a few terrified kids started freaking out and crying. We ran to our counsellors’ campsite in wooded area not far down the creek to tell them what happened. They were just teenagers themselves, and were sitting around a campfire talking and playing guitars. They just told us to get lost. In the morning we found a narrow trail paralleling the creek bed and saw branches snapped off the trees about shoulder height of the creature. The counsellors found this a bit strange, but figured it must have been a bear. I’ve seen films on TV and heard sensational stories about sasquatches over the years, but none of those have ever described anything like what we saw that night. We were able to get a response from Louise Standing, Todd's younger sister, she also wanted to make it clear, "...I have nothing to do with Todd's research and am really involved in no way!" We promised we would have the first version of Sylvanic.Com. This was launched back in May 2005. Gauging from the home page, you would guess the site is less about Todd and more about a mysterious place where people end up missing. A place called Sylvanic. 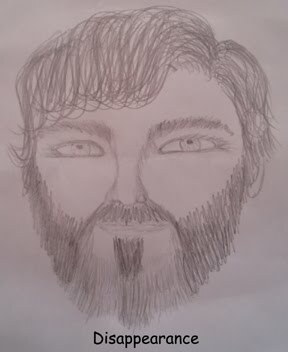 "Do you recognize this man? He may have gone missing in Sylvanic in 1936 along with two of his associates. This is a police composite drawing of what he would have looked like in 1936. He had a strong English accent and would have worked for the railroad in the early 1930’s or late 1920’s. His initials may have been J.P.G." Its got a cool interface just click anywhere on the timeline. Below is an example of the interface, where you can actually navigate through the website via a timeline. 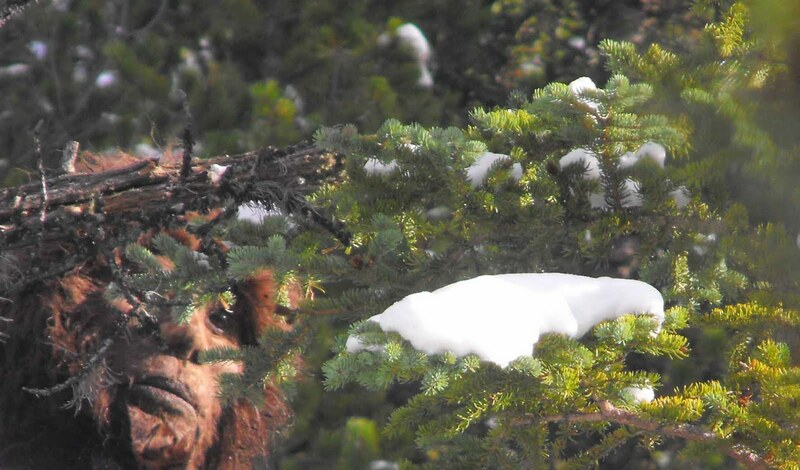 Photo "proof" of the Sylvanic Bigfoot provided by Todd Standing, below is an embedded video of which this still is from. 1.) A moment in the evolution of a television show, characterized by absurdity, when a particular show abandons its core premises and begins a decline in quality that is beyond recovery. 2. )Used to describe the moment of downturn for a previously successful enterprise. The phrase jump the shark comes from the climactic scene an episode opening the fifth season of the American TV series Happy Days in September 1977. In this story, the central characters visit Los Angeles, where a water-skiing Fonzie (Henry Winkler), wearing swimming trunks and his leather jacket, jumps over a confined shark, answering a challenge to demonstrate his bravery. "It's a moment. A defining moment when you know that your favorite television program has reached its peak. That instant that you know from now on...it's all downhill. Some call it the climax. We call it 'Jumping the Shark.' From that moment on, the program will simply never be the same." -- Jon Hein, creator of the now defunct website 'jumptheshark.com' which popularised the term. We think the term is most apropos when it come to Sylvanic. 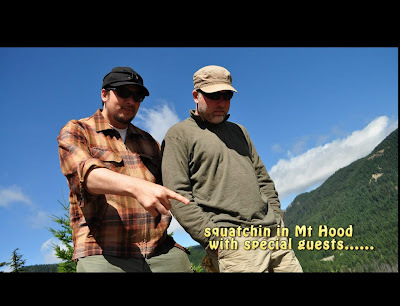 As you can see from the 4th Sylvanic expedition below, Todd Standing creates a Blair Witch style video, where he is actually attacked by Sasquatch. According to the video, ultimately the "attack" causes his crew to call in a Search and Rescue team to, uh, search and rescue Todd Standing. Enjoy the video below we have no idea how long it will be up. First we like to thank fan, Tom Larson, for bringing this to our attention. Todd Standing has been erased from the internet. At least he has been erased from three major places. We tried to contact Todd's listed email as the administrative contact of Sylvanic.com for some answers and as of this morning we have still not heard back. What we do know is the erasing of Sylvanic and Todd Standing has not been an accident, meaning the domain has not expired. Sylvanic.com does not expire until November 9th of this year. The site is down because Todd Standing wanted it down. The You Tube videos are unavailable because Todd made them to be unavailable. Is Todd Standing and Sylvanic gone for good? 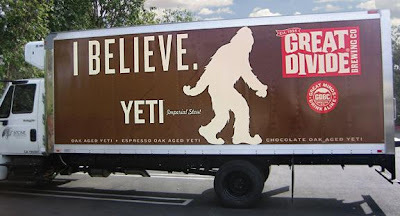 This would be good news, as you know we have been awfully critical of the Sylvanic Bigfoot. We became increasingly concerned when we saw Todd Standing was somehow participating with the highly-regarded Erickson Project. 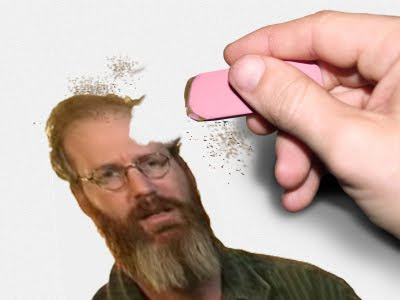 The fact that any trace of Todd Standing has been removed from the Erickson Project bodes well for the credibility of the project. The fact that any trace of Todd and Sylvanic.com has been removed from the internet bodes well for the rest of us who take Bigfoot research seriously. 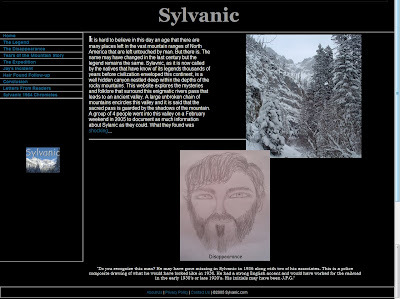 There is another explanation, Sylvanic.com may be going through a transformation and relaunch. This has happened before, when Todd has rebranded the Sylvanic website. 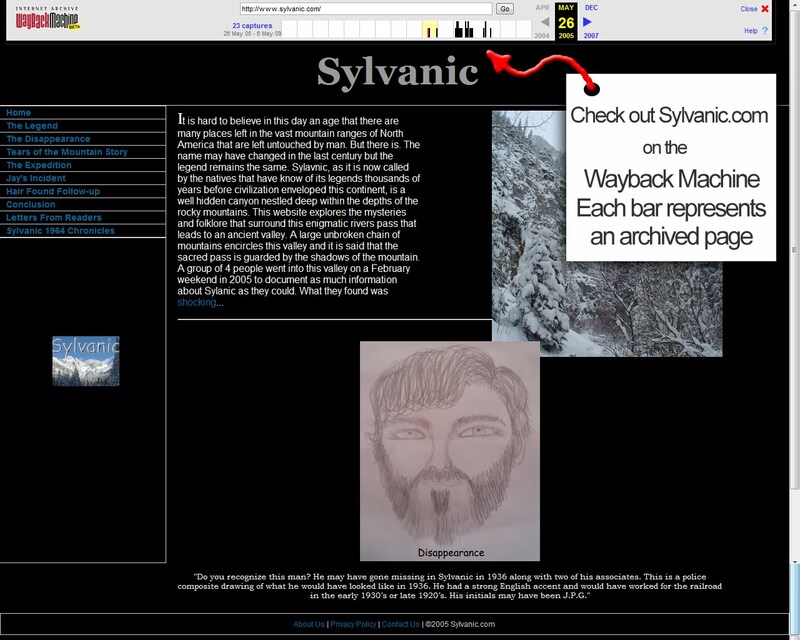 Stay tuned tomorrow when we provide you with screen shots and text of the Sylvanic Website on its first days back in April 6th 2005. As well as a journal he kept during the first few years of his project. Until then, please view below the YouTube videos, Todd doesn't want you to see. Stay tuned tomorrow where we share content from the Sylvanic.com's first year, circa 2005. This includes an online journal where Todd shoots back at his critics. READ OUR PREVIOUS COVERAGE OF SYLVANINC ON ONE PAGE! A Bigfoot creature is roaming the piney woods of south Mobile County, feasting on pretty blondes, brunettes and bad guys alike. Although this movie may not be as respectful to the Sasquatch as Christopher Munch's film Letters from the Big Man, it probably never intended to be. 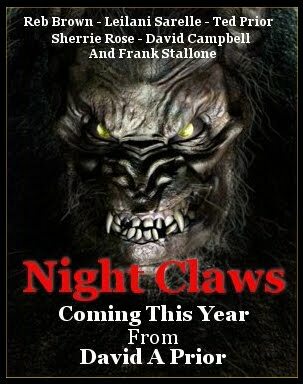 Sly Stallone's brother, Frank Stallone is starring in it. Even though he's the most famous of the acting ensemble, its not surprising he doesn't get top billing. After all, he can't even get a descent role when his own brother writes, directs and produces a movie. He played "the singer" in the first three Rocky Movies. You may remember Alissa Koenig from another David A Prior movie titled Zombie Wars. Actor Ted Prior, who has starred in about half the movies his brother has made in south Alabama, plays Koenig’s husband, Charlie Parker, a tough East Coast type on a camping trip, led by seasoned survivalist Sharon Farmer (Tara Sanford Kleinpeter). 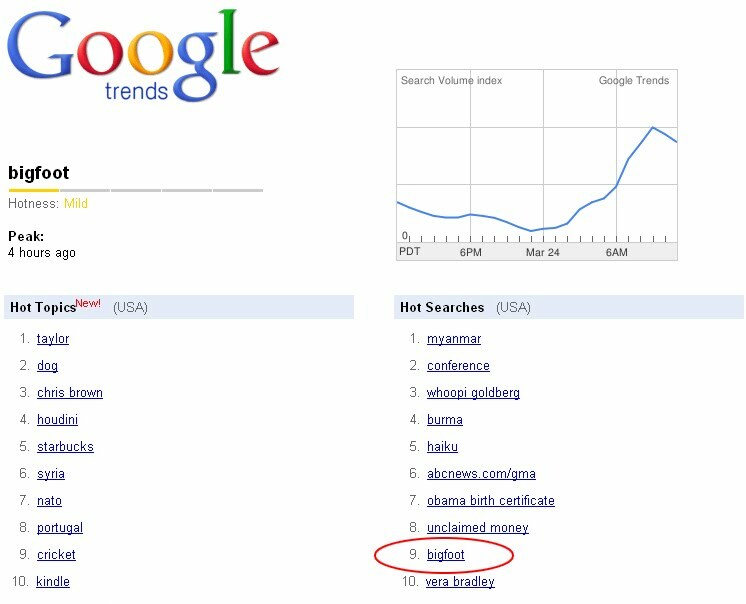 Bigfoot made it on Google's Top Ten search terms today. 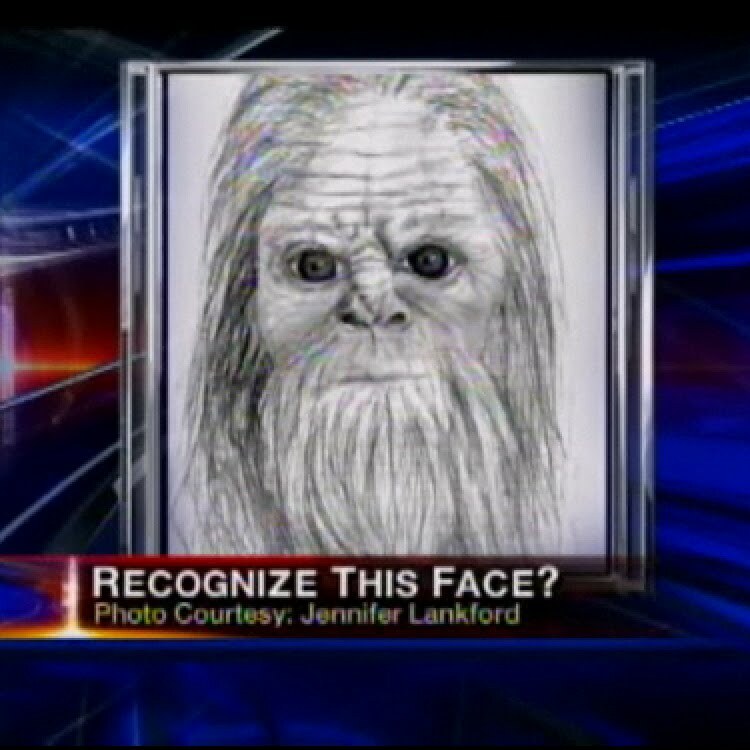 This has not happened since 2008 during the Geogia Bigfoot Hoax. 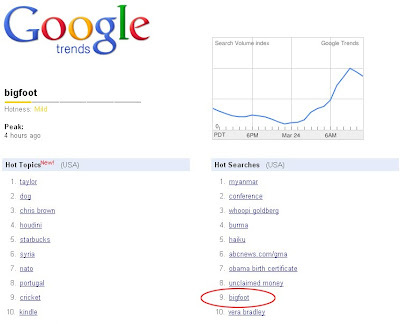 What has everybody searching for Bigfoot on Google? Most likely the new North Carolina's Knobby video we reported yesterday. It didn't hurt that MSNBC reported the Bigfoot story in its Tech and Science Section. Not all are pleased with MSNBC's categorization of Bigfoot. Another NBC Affiliate in the Bay Area takes time to complain. An incredibly fuzzy video of Bigfoot emerges. Fuzzy video? In 2011? MSNBC is breathlessly reporting -- in its "science" section no less -- the emergence of a new Bigfoot video, shot by a fellow in North Carolina. "Knobby," as the photographer nicknames him, walks across the road right in front of the camera. He contacted his local NBC TV station, "NewsChannel 36." He also posted the video to YouTube, writing, "Carolyn stopped the truck and I jumped from the truck with a small video camera and started shooting a video of the Big Foot as it ran across the road in front of the truck." What we wonder is how in 2011 someone, even someone in North Carolina, is using what appears to be a video camera designed by Galileo Galilei. The video is fuzzy and jerky and incredibly, saved as a .avi file. Even the camera on the iPad2 is better than that. While the video is fuzzy, apparently Bigfoot's Knobby's smell is very distinct. Says the man: "If you could have been there on that road and saw it live and smelled its horrid smell you would know that it had to be real. I know it brought cold chills to me when it looked just for a second at me and snarled or growled before it ran on up into the woods." If our inbox is any indication most Bigfooters are not convinced either. However, if you find the search trends of Bigfoot interesting, than visit the links below under the heading YOU MAY ALSO LIKE. One of them has interactive doodads! Just like the one below. Siberia Govt Wants to Study Yeti; Academia says, "No"
Its official, Siberian Officials are getting push-back from academia in their pursuit to establish an institute to study yetis. We have two great articles from two great sources. MOSCOW - OFFICIALS in a Siberian region on Wednesday announced plans to open a scientific institute for researchers to study yetis, despite opposition from academics. 'Organising an institute or a scientific centre would be a logical continuation of research into the yeti,' the administration of the Russian coal-mining region of Kemerovo in western Siberia said. The region will announce its final decision after hosting an international conference on yetis later this year, the statement said, citing the regional government's education and science department. 'The town of Tashtagol will host an international conference with leading experts into hominids. Based on its results, we will take a decision on opening a scientific research institute to study the yeti.' Yetis, or Abominable Snowmen, are hairy ape-like creatures of popular myth, that are generally held to inhabit the Himalayas. But some believe Russia also holds a population of yetis, which it calls Snow Men, in remote areas of Siberia such as the mountains in the southern part of Kemerovo around Tashtagol. Kemerovo officials cited yeti researcher Igor Burtsev as saying that around 30 Russian scientists are studying yetis and could work together at the planned institute. 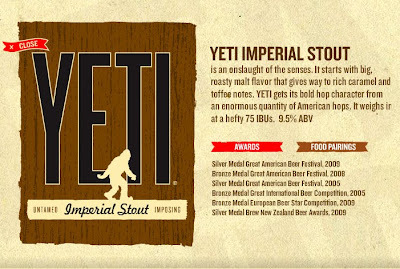 'We think that the yeti is a separate branch of human evolution. It lives in harmony with nature,' Mr Burtsev was quoted as saying. As geeks, we are encouraged to suspend our disbelief while simultaneously challenging everything we see and hear. In the words of Agent Mulder, we want to believe, but our geek roots are firmly planted in the scientific method. That tension is possibly being resolved on one front. The Russians are establishing a scientific institute on the study of yetis, hairy ape-like creatures rumored to inhabit the Himalayas. Officials in coal-mining region of Kemerovo Oblast announced plans today to open a Yeti Institute at the Kemerovo State University, a 38-year-old higher education entity in western Siberia. 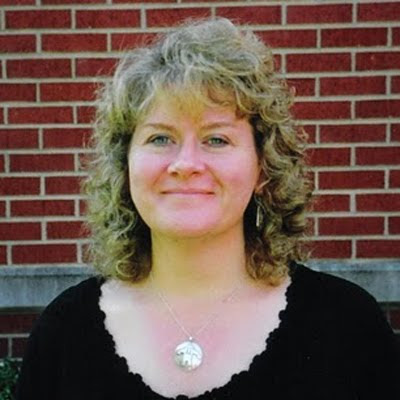 KSU boasts 31,000 students and is best known for reviving regional languages, like Shor. Yeti researcher Igor Burtsev reportedly claimed that 30 Russian scientists are currently studying yetis, or Abominable Snowmen, and the Institute could allow them to better collaborate. “We think that the yeti is a separate branch of human evolution. It lives in harmony with nature,” Burtsev was quoted as saying. Burtsev believes there may be a local community of these creatures that are Neandertals who survived extinction. The Yeti Institute is not a lock, though. The university denied Burtsev’s claim that it would be part of KSU, saying that “studying yetis is not among the research interests of the scientific teams at Kemerovo State University.” A final decision will be made after the town of Tashtagol hosts an international conference on yetis later in 2011. Leading experts of hominids will discuss the idea of whether it is worthwhile to pursue the yeti with formal science. The belief in a population of “Snow Men” in remote areas of Siberia is significant enough to celebrate Yeti Day on November 11. Cynics will note that it also marks the start of the ski season at nearby resort, Sheregesh. A 2009 photo revived local tourism and led to tours at the “Yeti’s Cave” where a large footprint was found. I don’t think it helps that this was first reported in the Daily Mail, a UK publication with a tendency toward sensational stories. We should add, for the record, Igor Burtsev said he was misquoted regarding the wars with bears. 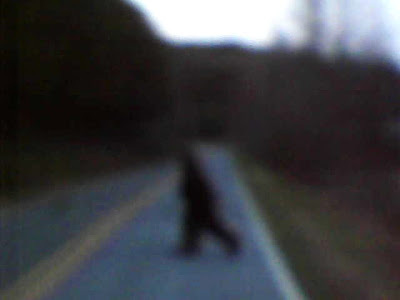 Thomas Byers snapped this photo of "Bigfoot" along Golden Valley Church Road in Rutherford County on March 22, 2011. North Carolina's most famous Bigfoot sighting was back in in the winter of 1979. According to the Gastona Gazette, a nickname was assigned to the sightings, Knobby, based on the multiple sightings around the Carpenter’s Knob area. North Carolina is a recent hot spot of sorts and as we have reported before, is where Animal Planet kicked off its, yet-unnamed, new Bigfoot TV Series. It is also famous for Mike Greene's Squeaky Thermal Video. WNCN is reporting a new sighting of "Knobby" based on a 5 sec video sent to them. CHARLOTTE, N.C. -- A Shelby man says he has captured video of Bigfoot. 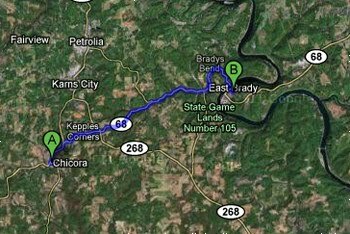 Thomas Byers e-mailed NewsChannel 36, saying he saw Bigfoot walk across Golden Valley Church Road in Rutherford County Tuesday evening. Byers' says he was about 15 to 20 feet away from the creature when he captured a five-second video. As I filmed it crossing the road it turned its head towards me and snarled or growled at me as it ran across the road. It was truly one of the most amazing sites I have ever seen. It was at one point only 15-20 foot from me and it happened so fast and shook me up so bad that I really didn't understand what I had seen until it was up the side of the mountain and out of sight. You can watch the video below of what I saw and you can hear its snarl or growl on the video as it crosses the road in front of the truck I and Carolyn were riding in. The embedded videos below show the 5 secs of Knobby and then Byers vocal reaction to the event. In Video 2 I took I was in the edge of the woods and you can hear me and Carolyn talking about what we just saw. Last year Cliff Barackman went on a Labor Day Bigfooting It was a weekend to remember. Fortunately, Craig Flipy video-taped the whole adventure. You may remember Craig and Cliff were both in a an episode of Bob Saget's show, Strange Days. The embedded video below has some great bigfooting gems provided by Cliff Barackman. Author Thom Powell's New Book, Shady Neighbors, is Available! It's official! You can now purchase author, Thom Powell's newest book, Shady Neighbors. For those few of you who do not know. Author Thom Powell is the acclaimed author of The Locals. The Locals was a ground-breaking anthology of several Bigfoot reports. Single-handedly, Powell breathed new life into Bigfoot research, promising and delivering a new perspective on the Sasquatch phenomena. He does it again in Shady Neighbors. On his blog, ThomSquatch, author, Thom Powell, says Shady Neighbors was a three-year process but you can read the cumulative decades of research that went into his newest book. After reading our advanced copy we can assure you he achieved his goal. As a piece of brilliant fiction, it stands alone. If you love learning what decades of Bigfoot research tells us about the creature? Shady Neighbors delivers. 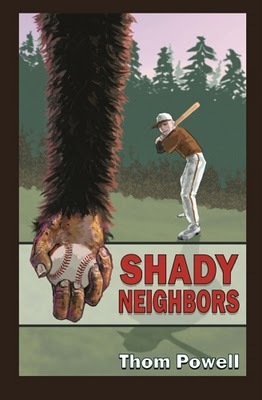 Read the history of the Shady Neighbors book cover. We are gonna start using Mondays for sharing breakthroughs in the primate world (at least the ones we think relate to Bigfooting). 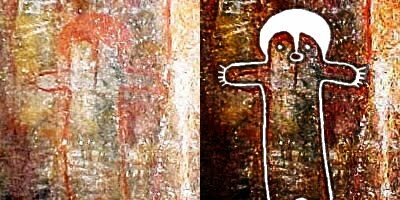 While we know there is a debate about whether Bigfoot is a man/animal/primate, and strong arguments for each theory, we think our best model for Bigfoot are other primates. So what's new in the world of primatology? The semantics of alarm calls. This ties in great with most of the recorded Sasquatch vocalizations we have. This excludes the Sierra Sounds. We covered the potential Sasquatch language discovered in the Sierra Sounds in another post last year. Our feeling is the Sierra Sounds are from acclimated Sasquatch, due to the fact that they were recorded in the same location over a long period of time. 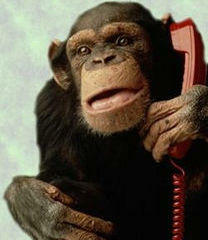 After all, it takes a while for a primates, and even humans, to get comfortable enough to converse around "strangers". Alarm calls are different, and the majority of recorded vocalizations are, most likely, alarm calls. How else can I tell I'm hearing alarm calls? According to Primatology.net: "Alarm calls are typically high frequency sounds because these calls are hard to localized by predators. On the other hand, low frequency sounds are easier to localized by predators. We refer to these three calls as leopard, eagle, and snake alarms. Leopard alarms were short tonal calls, typically produced in a series on both exhalation and inhalation. Eagle alarms were low-pitched, staccato grunts, and snake alarms were high-pitched "chutters." When monkeys were on the ground, leopard alarms caused them to run up into trees, where they appeared to be safest from the ambush style of attack typical of leopards. Eagle alarms caused them to look up, run into dense bush, or both, apparently to avoid an eagle's stoop. And snake alarms caused them to look down at the ground around them. Such responses suggested that each alarm call effectively represented, or signified, a different class of external danger. Vervet are not the only monkeys with these same alarm call traits. If alarm calls were exclusive to vervet monkeys, than it wouldn't have a high value to Bigfooting. Other Monkeys include white-faced capuchins, campbell's monkeys, diana monkeys and more. While we need a lot more evidence to determine if any of this is helpful to Bigfooting, we feel primatology has come a long way since wood-knocking and it wouldn't hurt to begin to incorporate some of the other traits shared by multiple species of primates. Over a year ago we covered a story, Bigfoot Prankster Claims Violation of Free Speech. Well, it seems the American Civil Liberties Union agrees with the prankster's claim and has officially decided to defend his rights. The ACLU describes themselves as, "our nation's guardian of liberty, working daily in courts, legislatures and communities to defend and preserve the individual rights and liberties that the Constitution and laws of the United States guarantee everyone in this country." These liberties include filming a video while dressed up like Bigfoot in a state park. True. True. If this guy was dressed like a giant rabbit we would not cover it, but then, we would hope FuzzyBunnyLunchClub would have. This associated press story was picked up by Yahoo, ABC, and NPR. Oh and of course by us. CONCORD, N.H. – First there was a Bigfoot sighting. 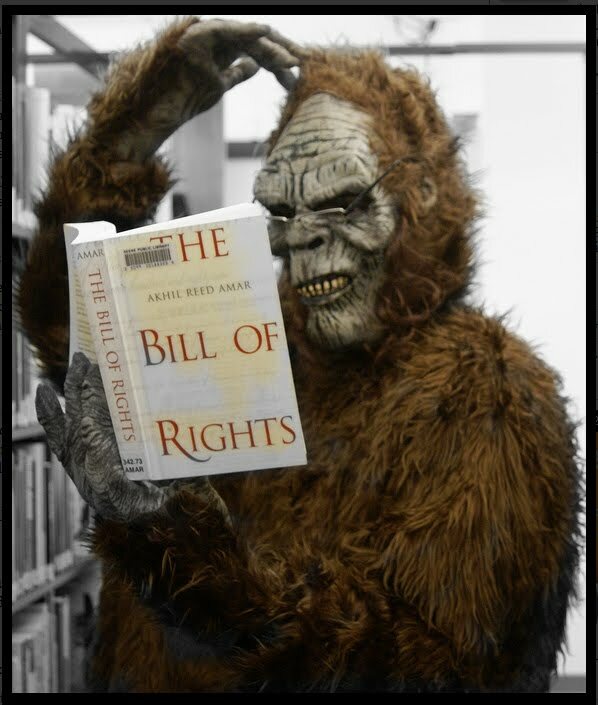 Now, there's a Bigfoot suing. A performance artist and amateur filmmaker who dressed as the mythical beast says New Hampshire park rangers didn't have the right to kick him off a mountain where he had been scaring, or at least amusing, hikers while friends videotaped his antics. Backed by the American Civil Liberties Union, Jonathan Doyle is suing the state, arguing that the requirement to pay $100 for a special use permit 30 days in advance and get a $2 million insurance bond violates his free speech rights. "The underlying activities are humorous, but the principle's important," said Jon Meyer, a lawyer representing Doyle. "We're talking about a very small-scale activity in a very large place. We don't believe there's any legitimate government role in regulation." Doyle's attorneys say no one complained to the state park service after Doyle first dressed as Bigfoot, ran around the rocky top of Mount Monadnock, returned to human form and interviewed bystanders about what they saw Sept. 6, 2009. "People loved it. It was socially engaging," Doyle, 30, told The Associated Press on Tuesday. "When I showed up at the top of the mountain dressed as Bigfoot and beating my chest, everyone just laughed and hoorayed." Hikers describing their encounters in a video Doyle posted on YouTube seemed happy to get in on the fun and inflate the legend. "At first I thought it was just a man in a suit making some sort of documentary, but then I saw it devour this man's friend and a small child," one man said at the top of the popular hiking spot as others behind him relaxed, admired the view and drank water. "I still see blood on the rocks." A boy who looked to be about 10 said he even took a photo of the legendary monster, which is more strongly associated with the Pacific Northwest than New Hampshire. "Yeah. I'm gonna put it on eBay, sell it for like $50," he said. When Doyle let it get out that he planned to return Sept. 19 to film a sequel, Monadnock park manager Patrick Hummel noticed. The subject line in an e-mail he wrote to his supervisor: "Bigfoot problem on Monadnock...not kidding." Hummel said in the e-mail he planned to intercept Doyle and added, "If you want to waste 5 minutes of your time, he's on YouTube." So when Doyle returned with a small band of costumed friends to film "The Capture of Bigfoot," they were captured themselves, sort of. Hummel interrupted the skit and barred them from filming, saying Doyle needed a permit. "Here I am in a Bigfoot outfit, and he's an authority figure and he's got a job to do," Doyle said, during a telephone interview from the U.S. Virgin Islands, where he is waiting tables to support his artwork. The interrupted skit — of Bigfoot sneaking up on a friend of Doyle's — had about 2,200 hits on YouTube as of Tuesday, while his Sept. 6 video had about 2,300. Doyle said he thinks officials found his Bigfoot stunt — and the publicity it generated — tacky for a mountain revered by literary giants Henry Thoreau and Ralph Waldo Emerson. Monadnock is a scenic mountain with views of four states from its 3,165-foot-tall summit. Emerson and Thoreau both hiked it and wrote about it. New Hampshire Civil Liberties Union attorney Barbara Keshen said in her brief that it is said to be among the most-climbed mountains in the world. A lawyer who was among the friends with him when Hummel stopped the filming forwarded details of the case to the ACLU. "Jonathan Doyle started this thing with nothing but good humor and intentions," Keshen said. "But it does have serious overtones." Keshen and the state both filed motions Tuesday seeking favorable verdicts. Doyle is seeking attorneys' fees, nominal damages and to be allowed to videotape on Monadnock without having to get a permit. Both sides agree there's no need for a trial because no facts are in dispute. What they dispute is whether the administrative rule requiring permits, as it was applied to Doyle, violates his First Amendment rights to free speech and expression. New Hampshire's department of resources and economic development, which oversees the park system, referred all questions to the attorney general's office because the case is in litigation. Assistant Attorney General Matt Mavrogeorge said the rule is constitutional. Doyle, who grew up in Keene and has attended several art schools but has yet to graduate, has done other stunts to elicit reactions. He created and drove a "Bat-Mobile" around Manhattan. He dressed as an angel and stood stock still in the main aisle of an Episcopal church. He also said he designs websites and murals and loves to paint. "I don't want to be locked in a Bigfoot suit forever," Doyle said. "I'd like to be able to do more." Bigfoot is the nickname given to sightings of large, hairy, human-like creatures that have been reported across the United States. Scientists are skeptical, at best, about its existence. In a previous post about Rick Lunsford of Cricket, North Carolina we quoted his description of his Sasquatch encounter 32 years ago (see Bigfoot Search Is On In Wilkes County). In an article at Winston Salem Journal (below), there is talk of Lunsford asking for some help to find another Sasquatch in the same area, in the hopes of having another encounter. Rick Lunsford didn't want to take his vision of Bigfoot to the grave without sharing it, and that's why he arranged an outing in Wilkes County Saturday to try to find the big guy. Those who would like to go on the next hunt can call Lunsford at (336) 667-4730. You can watch two earlier videos attached to this story below.